The purpose of HARKEN! 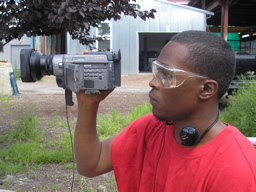 Youth Media / Workforce Training is to nurture critical thinking, creativity, and 21st Century skills while teaching documentary filmmaking. 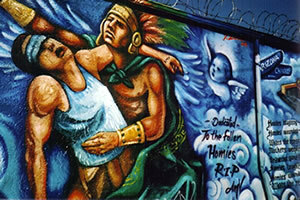 In 2002 in East Los Angeles, an environment where 50% of Latino students did not graduate from high school, Harken Productions saw the possibility of using Dramatic Improvisation and Documentary Filmmaking to empower these underserved, gang-affiliated and frustrated youth. We taught them to master their environment by learning storytelling, drama, and technical skills associated with camera work, interviewing, and editing. Out of this experience HARKEN! Youth Media was born. We take a media literacy approach with the content of our productions. Media Literacy is the ability to interpret and create personal meaning from the hundreds, even thousands of verbal and visual symbols we take in through TV, radio, computers, newspapers, magazines, and advertising. In learning these skill sets, students also develop strong social and life skills such as organizational abilities, leadership, team participation, commitment, accountability and the overall responsibility for producing an excellent product for which they can be very proud. Four students at the MET School were trained in all aspects of video production and took on the task of making an orientation video for incoming freshman to the school. This video was in response to the passage of the "Executive Order" in Rhode Island which had significantly impacted the students involved in the making of this video. Through the influential medium of filmmaking, Harken Productions gives youth and young adults work experience in video production preparing them for entry level jobs in film, television, journalism and advertising industries. New technologies and creative applications need to be taught to our youth and young adults for them to be competitive in the workplace. At Harken Productions we achieve this through technical training on camera, sound, lighting equipment and editing software. Orientation to video production and team collaboration. Role and responsibilities of the video production team. Internet & library research into chosen documentary or promotional video idea. 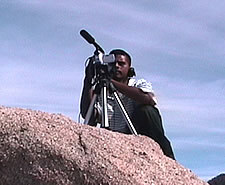 Training in camera technology, composition and sound recording. Training in lighting set ups and equipment usage. Interviewing styles and techniques/ communication. Introduction to Final Cut Pro editing software. The role of music, narration and special effects in film. Shooting the chosen short documentary including B-roll. Final Cut Pro editing: capturing and logging footage/adding and subtracting time code to define scenes. Inclusion of voice over, music and sound effects as needed. Finalize edit and layback to master of final production. HARKEN! 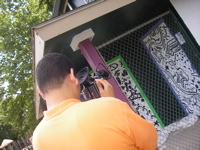 Youth Media has a proven model of 12 and 16 week training programs. Customized programs are also available. Michelle ..."has brought a profound level of understanding of the economic, social, academic and emotional struggles that our students face to her work through filmmaking. Each video she has produced with our students has yielded a level of skill sets, critical thinking and media literacy that has exposed our youth to new options in further study and life."